They have since ancient times denoted purity, passion, and healing. A symbol of Venus, the Goddess of Love, because of its heart shape and bright red color. Shakespeare’s Othello decorated Desdemona’s handkerchief with their symbolism. Madame Tallien, a prominent figure at the court of Emperor Napoleon, bathed in their juice. Medieval stonemasons carved designs depicting them on altars and around the tops of pillars in churches and cathedrals. We are of course talking about Strawberries. These sweet, red jewels are in abundance this month as they ripen through April and May, making them the first spring fruit to make an appearance and brighten our lives with the promise of warmer days and sunshine. All across North Carolina (ranked fourth in the nation) strawberry season is being celebrated this month with gatherings and festivals paying homage to the red berries. Whether you venture out this month to pick your own berries, buy a carton at the farmers market, or take a road trip to one of the festivals, Carolina strawberry season is short so you’ll need to act fast. If you’re looking for an excuse to take a road trip then head to the 15th annual Franklin County Strawberry Festival on May 10, at the Rocky Mount Farmers’ Market. The Strawberry Skillet Cake recipe won the judges over in last year’s annual baking competition. Beat butter, sugar and gelatin 3-4 minutes. Add eggs and vanilla. In a separate bowl mix flour, baking powder and salt. Slowly add flour mixture and buttermilk to egg mixture. Mix until fully combined then fold in strawberries. Spread in skillet and cook for about 50 minutes. Serve with fresh whipped cream or vanilla ice cream. The Carolina Strawberry Festival began in the early 1900s when Wallace, N.C. was known as the world’s largest strawberry exchange. During WWII, the festival fell into a hiatus, and in the years that followed other Strawberry Festivals sprung up around the Carolinas. It was resurrected in 2010, and the modern Carolina Strawberry Festival was reborn. Each year the festival hosts a baking competition in three categories: Appetizers, Breads & Biscuits and Desserts, and each recipe features fresh-picked North Carolina strawberries. Sara Ellison won the baking category with these delicious fresh strawberry cupcakes. Place strawberries in a blender; puree until smooth. Transfer strawberry puree to a saucepan over medium heat and bring to a boil stirring often until puree is reduced by half. Remove from heat and cool completely. Beat butter and cream cheese until light and fluffy. Beat 1 cup confectioners sugar into mixture until blended. 5. Beat 2 tablespoons strawberry puree and vanilla extract into butter mixture until just blended. Repeat with 1 cup confectioners sugar, followed by 2 tablespoons strawberry puree, repeat twice. Preheat oven to 325°F. 2. Line a muffin pan with cupcake liners. Place strawberries into a blender and blend until smooth, strain to remove seeds. In a large bowl, beat together the eggs, white sugar, vegetable oil, vanilla extract, lemon zest, and strawberry puree until well combined. Stir in the flour, baking soda, salt, and vanilla pudding mix. Spoon batter into the prepared pan. Bake in preheated oven for about 23 minutes. Allow the cupcakes to cool at least 10 minutes before frosting. 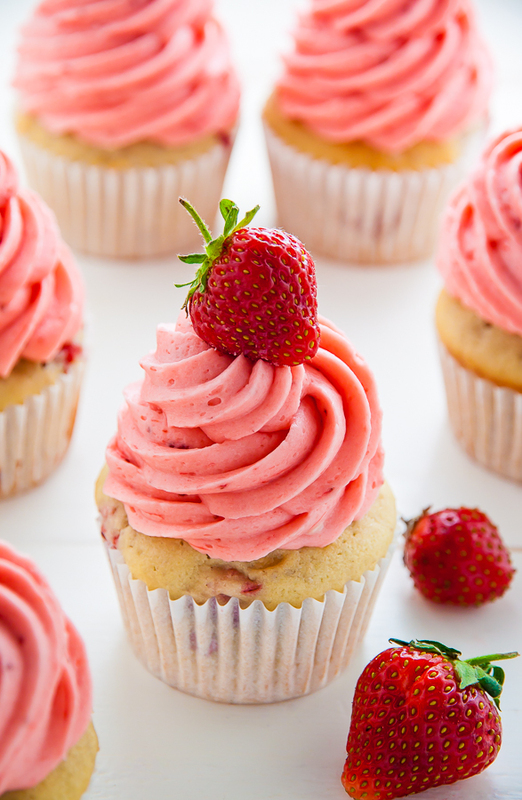 Once cupcakes are thoroughly cooled, ice with the homemade strawberry frosting and garnish with a fresh Carolina strawberry. Chadbourn, NC located approximately 54 miles west of Wilmington, was once dubbed the Strawberry Capital of the World. Each year the town hosts a Strawberry Festival – besides being the longest running agricultural festival in the state, the Strawberry Festival is also a major three-day party fit for the whole family. Find your summer spirit with a strawberry cheesecake from the festival’s youth winner Logan Elkins. Combine crumbs, sugar, and butter. Press in bottom and up sides of a 10” springform pan. Bake at 300°F for about 8 minutes. Beat cream cheese and sugar until fluffy and eggs one at a time then stir in flour. Reserve 1 ½ cups of batter, pour remaining batter over Graham cracker crust in the pan. Combine 1 cup reserved batter with strawberry syrup and extract. Pour over batter in the pan. Drop remaining batter by the tablespoon over strawberry batter. Use a knife to create a swirl in the batter. Bake for 1 hour. Turn oven off and leave in oven (door closed) for 4 hours. Remove, chill and decorate with fresh Carolina strawberries.